Attention, parents of third graders: If demographic patterns hold, your children could be in the largest U.S. college freshman class ever. That’s because in 2007 U.S. births surpassed 4.3 million – a feat not seen since 1957, when college enrollment was less common. Based on trends today, demographers can make certain assumptions about what share of those children will eventually graduate from high school and go on to college. According to the Western Interstate Commission on Higher Education (WICHE), the high school class of 2025 will be the largest and most ethnically diverse class we’ve ever seen. This wouldn’t be the first time that colleges and universities have experienced a “college admissions bubble.” The last enrollment peak happened in 2009, when the children of Baby Boomers reached college age (and 18 years after 1991’s 4.1 million births). In addition, the Great Recession encouraged many young adults to ride out the difficult job market by continuing their education. Since 2009, the number of first-time, full-time freshmen has come down somewhat (from 2.5 million to 2.4 million in 2013). How can anyone know what college enrollment will look like a decade into the future? No projection is perfect and there are many unforeseen factors, such as the economy’s performance and how successful parents and schools are in getting students to graduate from high school. 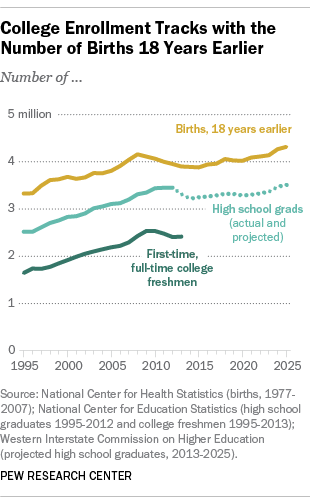 But generally, the number of first-time, full-time college freshmen tracks closely with the number of births from 18 years earlier. In the post-recession era, about 70% of high school graduates go on to be first-time, full-time freshmen in either a two- or four-year college. Apart from its size, the high school class of 2025 will also look different from today’s incoming college freshmen. Immigration and births of second-generation immigrants are likely to drive up the shares of Hispanic and Asian students. Over the past two decades, the share of students graduating from public high schools who are white and non-Hispanic has declined dramatically – from 73% in 1995 to 57% in 2012, according to the most recent data available. In that time period the shares that are Hispanic and Asian have grown. WICHE projects that this trend will continue, with the public high school graduating class of 2025 being barely majority white (51%). Young Hispanics will likely make up a larger share of high school graduates a decade from now, but today they are also the least likely among the major racial and ethnic groups to pursue full-time college enrollment. Another unknown factor for higher education is cost: Tuition has been rising rapidly at public and private universities, and the share of high school graduates in the class of 2025 who elect to pursue college full-time will also depend on how affordable college is and whether students and their families decide college is valuable.